‘Ava loved dresses. She had a dress in every color of the rainbow.’ and so this beautifully put together story begins. Simple yet elegant and educational Yellow Dress Day by Michelle Worthington follows the journey of Ava and her coloured dresses that are worn depending on the weather of the day. I loved the descriptive words associated with this book. They tease and tantalize the senses and sit happily in your mind for hours after you have shared the book. It is words like these that captivate and instil a love of reading in children, with the words nicely playing on the sounds and world around us. Words such as ‘swish and swirl and fall’, ‘whistling, whirly, windy day’ and ‘jumped and tumbled’ made us want to act them out as we visualized the movement of the environment on such a day. The colours of the dresses nicely matched the mood of the weather and Ava’s mood, giving recognition to the role colour plays in our life. Yellow Dress Day opens up a world of communication. The use of colour encourages recognition and discussion with Ava’s despair of her yellow dress being in the wash basket just right for talking about feelings, emotions and problem solving. How would you feel when you looked out the window and it was a whistling, whirly, windy day? What would you do for the day? How would you feel if the dress you wanted to wear was in the wash? What could you do to solve the problem? Beautifully present Yellow Dress Day lifts the spirit, instils fun and laughter and is easy for children of all ages to relate to. In the first instance the cover captivates in a fun spirited way, enticing you to open the book in order to grab more of the fun inside. Illustrator Sophie Norsa has done a wonderful job at complimenting the story, providing colour that uplifts and gives a visual to the descriptive. commitment of a team of professionals. 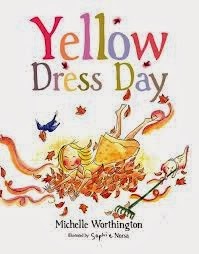 You will definitely not be disappointed when you purchase a copy of Yellow Dress day by Michelle Worthington.